There are so many great things to do with my children, but one of the simplest ways that I enjoy spending quality time with them - especially with my daughter - is by brushing and styling her hair. I find this a bit odd seeing as I hate brushing and styling my hair. After all, my hair never does what I want it to do, it gets frizzy, is turning grey (or "super blonde"), and it just takes a lot of time. 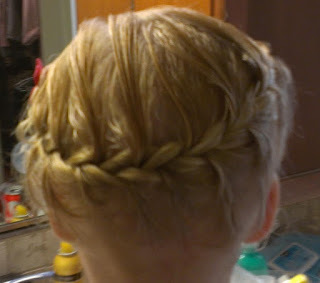 Even though my daughter has pretty much the same hair as me (I mean, it is the color that I tell my stylist to make mine every time that I go in for a hair appointment), it's so much more pleasant and rewarding to style my daughter's hair. Brushing my daughter's hair isn't just about getting out the tangles. This simple act of proper hygiene gives the two of us time to sit and chat about the day, about troubles or wishes. It's a bonding time for us...time for the two of us to just sit and be together even when the rest of the day has been filled with school, homework, extracurricular activities, making meals, cleaning, and all of the other busyness of family life. There is always time to sit down and spend even a couple of minutes brushing hair. During this short time, we have discussed the high's and low's of her day. We've talked about problems she is having and ways to overcome them. While brushing her hair, our bond as mother and daughter is strengthened. But, it's not just my bond that's strengthened; Daddy also gets to enjoy this time when he has the opportunity to sit and brush and/or style her hair. Daddy gets to learn the inner makings of his daughter's mind simply by sitting, brushing and listening. Mommy and Daddy, during this time, get to become the sought after hair stylists who listen and offer advice or just become closer friends. It's amazing, too, how much a child can imagine through brushing and styling hair. She can become Elsa with all of her magical powers simply by having her hair braided. She's a rock star or an Olympic runner with a simple pony tail. She becomes a ballerina, teacher, or business leader by changing the pony tail into a bun or French Twist. But, my favorite is when she asks for her hair to be curled so that she can look just like me. While brushing and styling my daughter's hair may seem like an insignificant and trivial act. And, while I've battled with what my daughter's young mind will learn about the concept of beauty and the presence of hair through this action, I will continue to enjoy the time we get to spend doing more than just getting out the tangles.